The Green Lantern movie will soon be on its way to theatres, and the toys have just hit stores. Every new ad makes the movie look just a little bit worse, and in keeping with that theme, most of the movie toys are inexcusable garbage. Look for them to choke aisles for months to come. There are a few, however, that may be worth your money. Mattel has continued the "Movie Masters" line that they started with The Dark Knight, offering "highly" poseable figures in a 6" scale. There are plans for at least 14 figures, but the first series includes just three: Hal Jordan, Tomar-Re and fan-favorite Rot Lop Fan. Now, there are no bios on the back of the Movie Masters packaging (a source of much consternation to our own Rustin Parr), so let us fill you in. Rot Lop Fan was an inhabitant of the Obsidian Deeps, a black and lightless void in space. 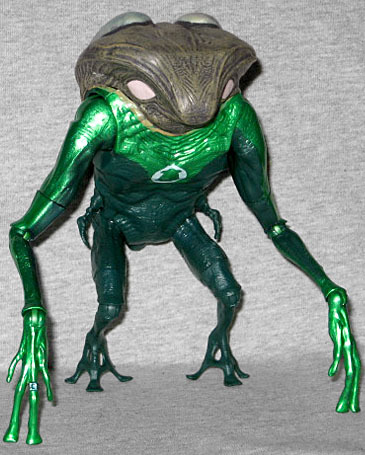 He was approached by Katma Tui to serve as a Green Lantern. Rot Lop Fan could not understand Katma Tui's request, because the lifeforms on his world are unable to perceive light. Without an understanding of light and color, "green" and "lantern" had no meaning to him, and could not be translated by the power ring. The figure gets a unique sculpt, which may not seem like a lot since there are only three figures out so far (five if you count the Sinestro and Abin Sur that are available in various store-exclusive two-packs), but those are humanoid bodies that can be reused: the only thing Movie Masters Rot Lop Fan could ever be turned into is comicbook Rot Lop Fan. The other guys all have the same kind of anatomy - Rot Lop Fan is a giant frog-man, not even close to the same shape as anyone else. The figure has a great texture. Kyle Hal's costume has this really tacky "ribbed" pattern all over it, but RLF's uniform looks more like a traditional comicbook costume worn over slightly loose, baggy skin. He's got a wee pot-belly and realistic anatomical details. Honestly, the only substantial differences between this figure and the comics are his skintone (he should be white, not brown) and the "alienized" hands and feet. The head is the perfect shape, sort of a wilting triangle. Here's a question for you: do you think the small dots near the corner of his mouth are his atrophied eyes, or the two silver pods on his back? Our money's on those being his ears: imagine them rippling like Grendel's swollen eardrum in Beowulf. They'd have to be huge, since they're his primary sense organs. Paint really varies from figure to figure. I bought the first Rot Lop Fan I found, because it's really exciting to get a figure of him and I didn't want to miss out. There's a bit of brown slop where the head joins the body, but looking at other samples suggests that's supposed to be there, like a glimpse of neck above the collar. 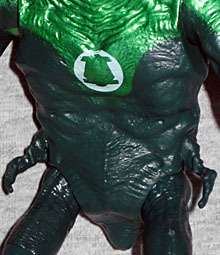 The lighter green on his torso seems to have been applied off-center: his Green Lantern symbol is dead in the center of his chest, but the costume isn't spaced evenly around it. Oh, wait, sorry: not a Green Lantern symbol. Rot Lop Fan isn't a Green Lantern, and he's not a member of the Green Lantern Corps; thus, the symbol on his chest isn't a GL insignia. Beware my power: The F-Sharp Bell! Like we said, the words "green" and "lantern" had no meaning to him, so instead, Katma Tui had him choose a pleasant tone and inducted him in the F-Sharp Bell Corps. He uses the ring to create a bell (the way Hal uses it to create fists), and through the bell can manipulate sound into constructs just like the GLs do with light. 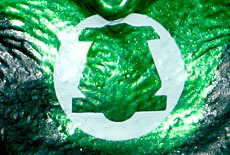 Thus, his logo is a bell, not a lantern. He even gets a unique oath! Articulation is just about as good as you could hope for. 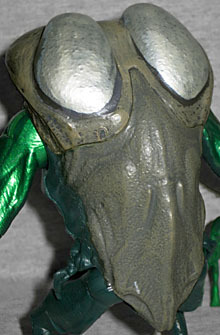 The prototype figure had a chest joint, but that really wouldn't suit the character's design. As it is, he moves at the shoulders, biceps, elbows, wrists, hips, thighs and knees. The biceps and thighs are swivels, while the elbows and knees are swivel/hinge joints, meaning that they already had that range of motion: why duplicate it? Since his arms are long enough to reach the ground, he stands securely. Rot Lop Fan has no accessories, not even the bell he makes with his ring. All he gets is a part of the Movie Masters BAF, Parallax. Actually, all three figures get the same piece: a smoke tendril. Because as you've seen in all the trailers, Parallax is a big yellow cloud. The sculpt is actually really good, with various skulls and faces (including Tomar Re's!) seemingly pressing out from the inside. The tip of the tentacle has a demonic head and two nubby arms, and the whole thing is bendy. 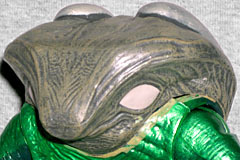 It's 11½" long, and cast from translucent plastic that's been painted solid near the base. Rot Lop Fan was created by Alan Moore, and is one of the more inventive GL characters. 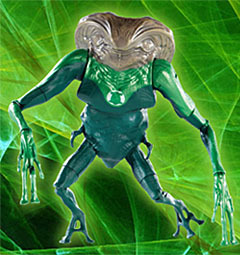 It was surprising enough that he'd appear in the film at all, and now he's one of the first Green Lantern movie toys released? That's awesome. Given how close this toy is to the comicbook design, we may see another Rot Lop Fan in the future, but do you really want to take that gamble, or do you want to buy the sure thing right now?